In May last year the RSPCA NSW entered the property of a 69 year old woman. The animals on the property were living in squalor. All 31 dogs and 43 cats were seized. The owner was charged and received a $19,000 fine and one month jail. The situation was obviously dire. But there was two great positives in the story - the pets were now known about by authorities and they were alive. A pet who is alive - even if they have suffered in the past - has a chance at a happy future. That is what rescue is all about. In the case of the 31 dogs - while exact numbers weren't offered in the RSPCA NSW media release - "some" were saved. However, guess how many of the 41 cats survived being "rescued" by the RSPCA NSW. If you said half, that would be terribly sad, but might have been considered reasonable. Because half the cats may have responded to treatment over time, while the others may have struggled or succumbed to illness. If you said one in four were saved, and this would have been a disastrous outcome. But, maybe if you were looking at worst case scenarios and these cats were very, very sick - nearly dead when they were found. Sometimes the situation is working against you - do what you can. All cats were suffering from severe psychological damage and many from untreatable medical conditions, and were unable to be behaviourally rehabilitated. All cats had to be humanely euthanised. It wasn't one half the cats who were saved. Or even one in four. Or even one. Single. Cat. They didn't save even one. ... over 40+ cats seized and killed by the RSPCA, all with treatable illnesses. Cats with symptoms we treat every day. Beautiful cats that deserves a chance at happiness after that hell hole. Those cats looked calm and I call BS on not able to be rehabilitated. All creatures great and small my arse. The RSPCA NSW has a history of using killing as a "rescue" technique - killing even tiny, poodle cross-breed pups. Of course, they usually don't publicise which pets actually make it out of these raids alive, so there is very little information available to the gift-giving public on outcomes. But they have announced this cat-slaughter with impunity thinking the public don't care about a few dozen cats and it adds to the dramatic effect. It defies all logic that not a single cat was able to be saved in this raid. The RSPCA raided professional dog groomers.... home after finding about 40 cats dumped in the forest 1km from where she was running Domestic and Farm Pet Rehoming...“75 per cent of the cats were suffering health issues”. 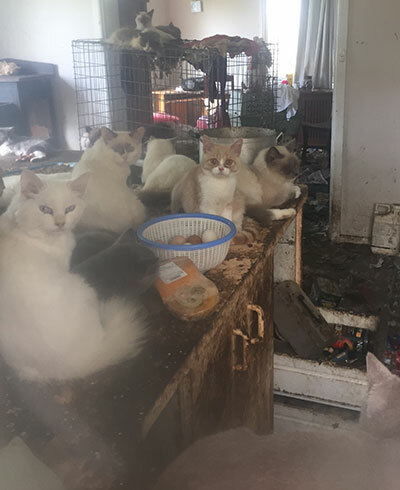 (Defence lawyer Matthew Tutt) said all of the cats – which were adults – had been safely rescued and new homes found. The RSPCA NSW are failing pets. They underperform in comparison to their peers. They are by far the richest of the charity animal welfare organisations, with more than $100 million in cash and assets.